Broadly speaking, there are four types of laughter. And I’m just making these up now, so if you can think of a fifth or sixth, congratulations, Newton. The first, and probably most common (sadly), is the fake laugh. It has many motivations and can sound one of a thousand different ways, and I trust you're familiar with them. So, moving on... The second is the small genuine laugh. This covers a spectrum from a quick chuckle to a snort to even those reactions that are unaccompanied by noise – maybe just a slightly stronger exhalation or an unrestrained smile. I would still consider those laughs in this category. The third is the large genuine laugh. It bursts forth spontaneously without you helping it along (and simply helping a laugh along doesn't make it fake, as I hope we can all agree). It's like the small laugh, but less controllable. The fourth is the dear lord I’m going to be hospitalized if I don’t stop laughing so I have to flee the thing that is making me laugh or think about the Holocaust or my own death or something because seriously...laugh. In my opinion, you’re lucky if you experience this last type a couple of dozen times in your life. I can think of only a handful I’ve enjoyed/suffered through myself. One of them occurred at a New Year’s Eve party in Houston a few years ago. Jack, a friend of a friend who I was meeting for the first time, had some passionately held opinions about the giant squid. He was (is) a smart guy, so a lot of his pontificating was for show, but it was a good show. He went from an earnest discussion of the few things we knew about giant squid at the time to an elucidation of his own theories -- including one positing that during great floods throughout history, giant squid rode the waters into our centers of learning, receding back into the oceans with a bit more of our knowledge each time. Yes, alcohol was involved, but I'm telling you, this was incredibly funny stuff. Don't look at me like that. That looks like the Marsellus Wallace of the sea to me. Or at least a solid decade's worth of calamari. I've always reserved a spacious and scary room in my imagination for large underwater life. Like a lot of people, my favorite part of just about any museum remains the Blue Whale hanging at the American Museum of Natural History in New York. At this point, I just love it. As a kid, I loved it and it genuinely freaked me out. My fascination and fear aren't reserved for living things, though. 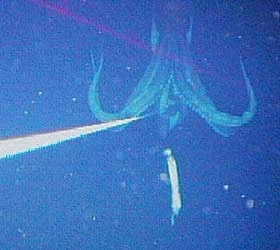 I've had a recurring nightmare throughout my life (not for a few years, but writing about it will probably change that) in which I'm swimming along the bottom of the ocean and very suddenly come upon an enormous sunken object, normally an airplane or a ship. I watched a documentary about the deep sea on PBS a couple of years ago that inspired my atheist self to think that maybe Richard Dawkins can stuff it. You know, if I'm honest, I don't really care all that much about space travel. On the other hand, every time I see something from the bottom of the sea, I go completely geek-happy for hours reading everything I can about it. I'd chuck the space program for a comprehensive deep sea program in a heartbeat. I agree. My friend Nick also agreed, but smartly pointed out that this is partly because of what they're finding down there. To paraphrase him, "If they were finding giant squid on Saturn, I'd be getting fitted for a hyper-absorbent diaper right now." Can we go back? No? Fine. I'll console myself with the idea that there's an even larger one down there -- 90 feet long, not 30 -- and that it's fresh off a surreptitious trip to the research archives at Tulane. Although you covered Jack's giant squid performance brilliantly, you left out the part where Justin denied the very existence of large squid. Shows what a PhD from Harvard will get you. To relate the size of the giant squid in a more plebian vernacular, the BBC reported that, were calamari be made of this singular specimen, each piece would be the size of a tractor tire. 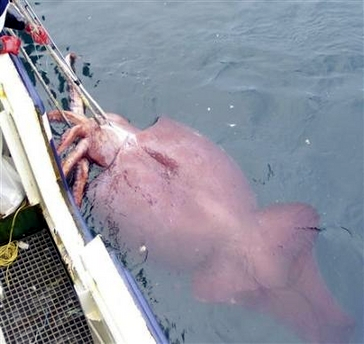 It's actually a "colossal squid". Apparently, the giant squid is a tad smaller. Who knew?